Can The Rebounding Market Keep Going? 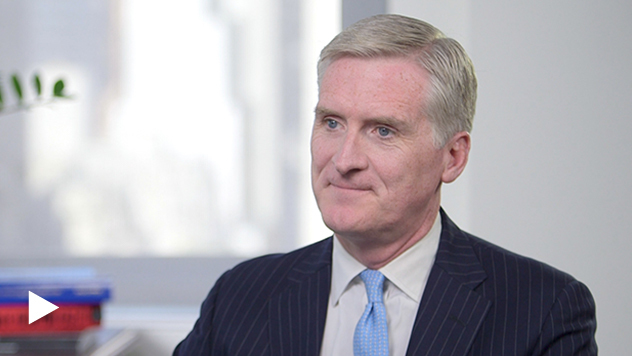 Co-CIO Francis Gannon discusses the disconnect between the markets and the economy. How volatile was the market during the second quarter? Volatility surprisingly in the market moved down in the second quarter after rising dramatically in the first quarter of this year. So 33% of the trading days in the Russell 2000 were 1% moves in the first quarter of this year, and that dropped to 19% in the second quarter of this year, and contrast that, you know, year to date, we’re about 26% versus 40% over the past 20 years. The average percentage includes data from 1998-2017 and does not include YTD data. So we do think that volatility is going to increase. I think many investors were lulled to sleep last year by the lack of volatility in the overall market. But as an active manager, higher volatility we think is a positive thing. And you should be seeing more volatility in the market going forward. Volatility, important to note, is not mean reverting, so it does tend to happen in pockets and we think that’s actually quite healthy. Why do you think that the economy and market look disconnected? There does seem to be this dislocation, or almost dichotomy between the markets and the overall economy. Clearly evidence is presenting itself showing that the domestic economy is getting stronger. We’re seeing that only from earnings, but we’re hearing it from businesses as well. The overall tone that we hear from the business is actually quite positive. Yet the market seems to be focusing on many of the businesses that have worked before. So in the second quarter we saw healthcare do quite well. We saw non-earners do quite well. We saw bond-like proxies do well for periods of time. And I think part of that is just the market being the normal market. Investors are tending to focus on what has worked in the past, as opposed to looking out three to five years. Our job as fundamental investors is to look at the underlying fundamentals of the companies in front of us, take advantage of those market moves when we can. 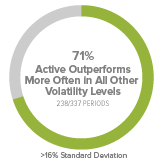 Why is higher volatility better for active managers? Higher volatility portends well for active managers. 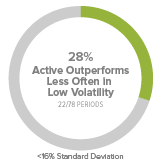 Lower volatility tends to help out passive managers. 1 “Active” represented by Morningstar’s U.S. Small Blend Fund. There were 539 U.S. Small Blend Funds tracked by Morningstar with at least 5 years of performance history as of 6/30/18. Standard deviation is a statistical measure within which a fund’s total returns have varied over time. The greater the standard deviation, the greater a fund’s volatility. And over the past seven years, we’ve seen a variety of moments where volatility has been quite low, and passive has done quite well. One of the things we think as we get to a more normal environment going forward is that you’re going to see higher volatility. It’s part of the reason why we believe active managers should do better going forward. The thoughts and opinions expressed in the video are solely those of the persons speaking as of July 9, 2018 and may differ from those of other Royce investment professionals, or the firm as a whole. There can be no assurance with regard to future market movements. The performance data and trends outlined in this presentation are presented for illustrative purposes only. Past performance is no guarantee of future results. Historical market trends are not necessarily indicative of future market movements. Frank Russell Company (“Russell”) is the source and owner of the trademarks, service marks and copyrights related to the Russell Indexes. Russell® is a trademark of Frank Russell Company. Neither Russell nor its licensors accept any liability for any errors or omissions in the Russell Indexes and / or Russell ratings or underlying data and no party may rely on any Russell Indexes and / or Russell ratings and / or underlying data contained in this communication. No further distribution of Russell Data is permitted without Russell’s express written consent. Russell does not promote, sponsor or endorse the content of this communication. The Russell 2000 Index is an unmanaged, capitalization-weighted index of domestic small-cap stocks. It measures the performance of the 2,000 smallest publicly traded U.S. companies in the Russell 3000 Index. The performance of an index does not represent exactly any particular investment, as you cannot invest directly in an index. Sector weightings are determined using the Global Industry Classification Standard ("GICS"). GICS was developed by, and is the exclusive property of, Standard & Poor's Financial Services LLC ("S&P") and MSCI Inc. ("MSCI"). GICS is the trademark of S&P and MSCI. "Global Industry Classification Standard (GICS)" and "GICS Direct" are service marks of S&P and MSCI. Any information, statements, and opinions set forth herein are general in nature, are not directed to or based on the financial situation or needs of any particular investor, and do not constitute, and should not be construed as, investment advice, a forecast of future events, a guarantee of future results, or a recommendation with respect to any particular security or investment strategy. Investors seeking financial advice regarding the appropriateness of investing in any securities or investment strategies should consult their financial professional. Thanks. To activate, please click the link in the email we just sent. You are using an older browser. Some features may not work correctly. Newer browsers are more secure, faster, and more compatible with newer websites. Ultimately we think you will have a better experience. We've noticed that you have visited our website a few times. We've noticed that you have signed up for our website, but have not validated yourself. Please click below to send a validation email. This content is for Financial Professionals only. Check your email and click the link we sent. (vii) a person acting solely on behalf of a person or entity referenced in (i) through (vi) above. Rate this article and share your feedback. You are currently logged in with the email , would you like to sign out and login with the Royce Funds associated with the email? Note: By remaining logged in as current user, you may not have access to the same fund information associated with your email.